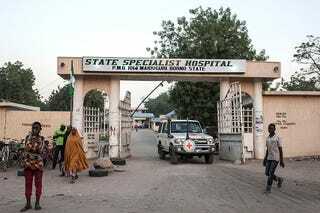 A meningitis outbreak has killed about 282 people in Nigeria, spreading across 15 states in the West African nation. Nigeria’s Center for Disease Control reported a wide outbreak of cerebrospinal meningitis. The agency reports that a new strain of the disease called “stereotype C” has emerged. Nearly 2,000 suspected cases have been recorded, and 109 have been treated since the outbreak began in February, but there are not enough vaccines to fight against it, according to CNN. Speaking of vaccines, in 2011, pharmaceutical company Pfizer made payments of $175,000 to families in the northern state of Kano, which was hit by Africa’s worst-ever meningitis epidemic in 1996. The Guardian reported in 2011 that 100 children were given an experimental oral antibiotic called Trovan, while another 100 received ceftriaxone. Eleven children died—five children died on Trovan and six on ceftriaxone. Legal action filed against the company alleged that some children received a dose lower than recommended, leaving many children with brain damage, paralysis or slurred speech. CNN reports that Nigeria is one of 26 countries in the African “meningitis belt” and has some of the highest incidences of the disease on the continent. The outbreaks peak in the dry season in certain states because of the low humidity and dusty conditions and usually end as the rainy season approaches, according to Ihekweazu. “Meningitis is a tough disease, especially during this period, and it is associated with overcrowding. Understanding the living conditions in the country, people must keep their building ventilated,” he said. Some common symptoms of meningitis are stiff neck, high fever, sensitivity to light, confusion, headaches and vomiting. About 5-10 percent of those who contract the disease die within 48 hours—even with the onset of treatment.